High Porosity For Increased Organic Adsorption And Nitrifying Bacterial Growth. 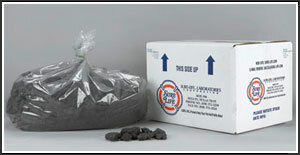 Chunks of porous, 99% pure carbon offers ideal filtering capabilities for heavily loaded bait tanks. When used in a filter system, our CHARCOAL™ is beneficial for removing unpleasant odors and waste materials. This product is very economical to use and requires fewer changes than other more expensive filtering materials. A healthier environment is maintained where improved water quality leads to fewer baitfish losses. Another advantage to our CHARCOAL™ is the fact that you do not have to remove it during water treatment or conditioning. Our CHARCOAL™ removes harmful gases, fish wastes and other organic waste which foul bait tank water. You should rinse BAIT-BOX FILTERING CHARCOAL™ well before using, with clean, cool water. On the average, we recommend the use of 4.5 pounds of CHARCOAL™ per 100 gallons of bait tank water. We further recommend that the CHARCOAL™ be replaced on a monthly basis. This product is not recommended for use in marine tanks.